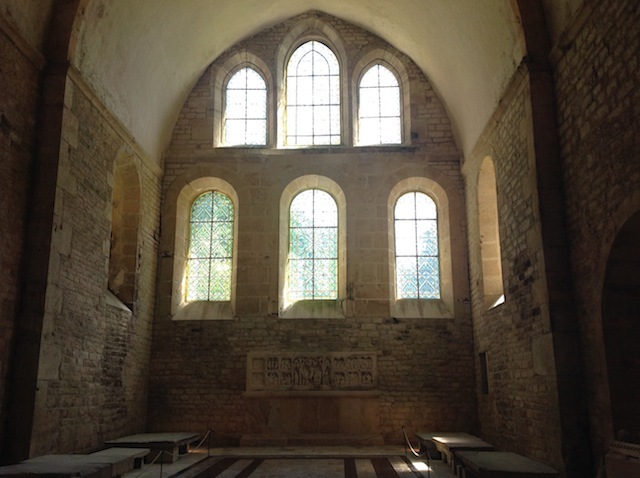 In an earlier post, I had mentioned the La Grange eatery in Flavigny-sur-Ozerain. They serve homemade cooking. 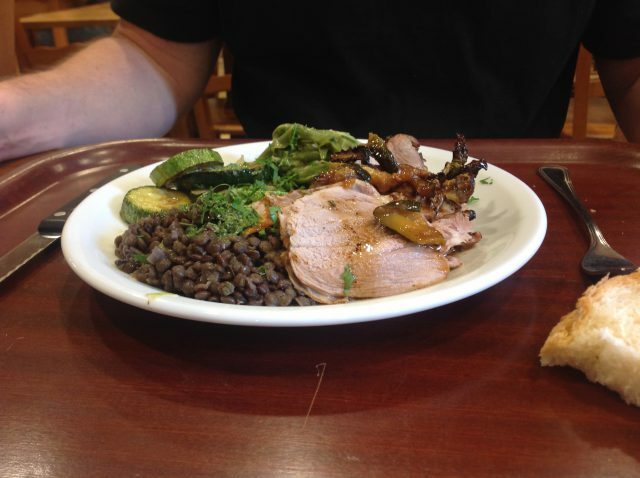 Here we had roasted lamb with black lentils and sauteed zucchini. This place has many customers. On morning, when the croissants were sold out, I ended up trying a local specialty. 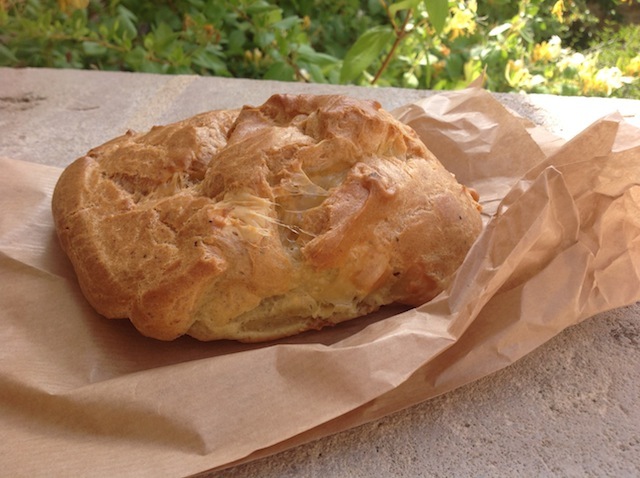 This is called a gougère and has a creamy cheese filling. Gougères are made of savory choux pastry mixed with cheese. This was my favorite place every afternoon. 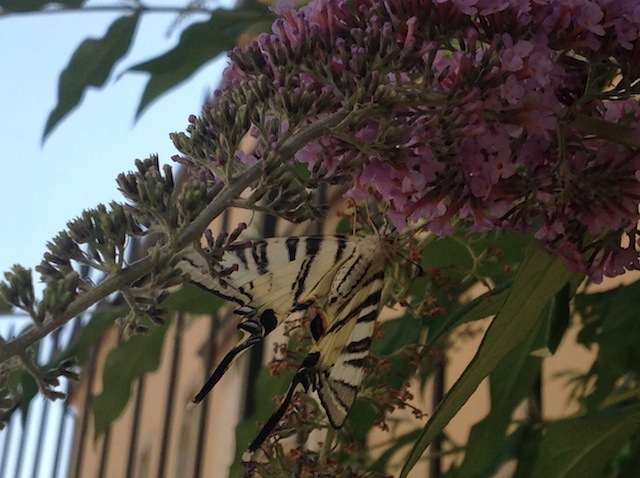 This area was full of butterflies! Most of them were attracted to purple and burgundy colored blossoms. 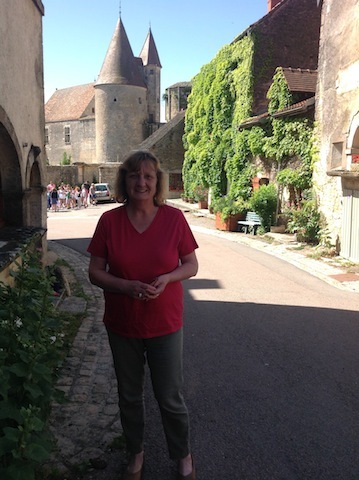 While in Flavigny-sur-Ozerain, most of my time was spent resting in the garden. If I wasn’t reading, then I was dozing in my lounge chair underneath a canopy of leaves. Some mornings, we drove around the vicinity and stopped in other villages for lunch. 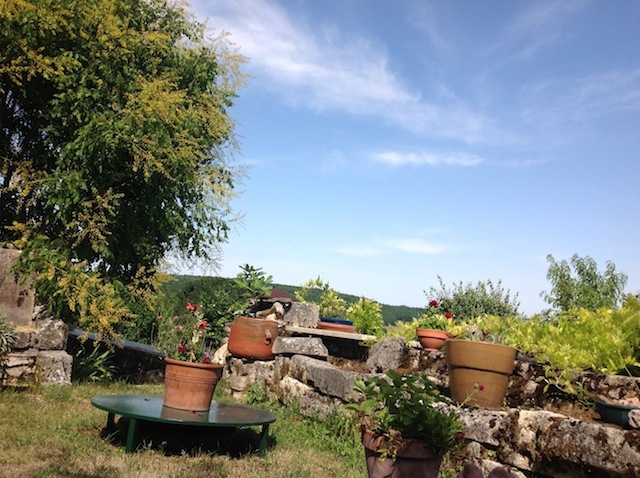 The best place to have lunch is right there in Flavigny-sur-Ozerain though. 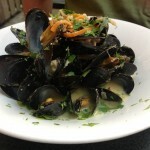 Visit the La Grange (open from noon – 6pm) for its daily specials. 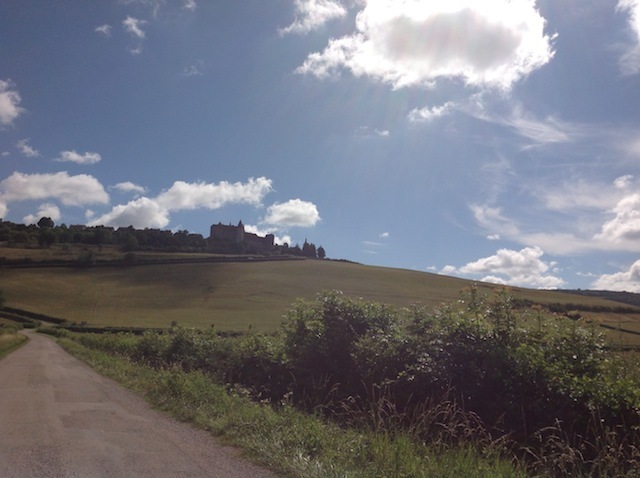 One of those morning trips took us back to Châteauneuf-en-Auxois, where we had vacationed in 2003. 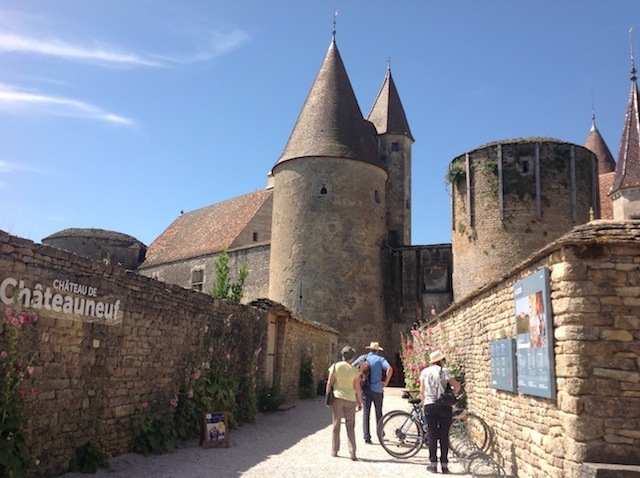 There are busloads of visitors coming to Châteauneuf en Auxois, including students on field trips. 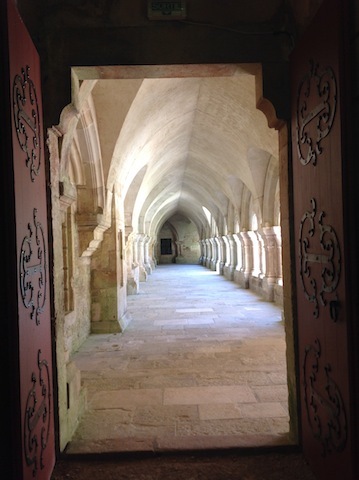 We also visited the Abbay of Fontenay one morning (entrance fee: euro 10 p.p.) In 2004, the gardens of Fontenay were awarded the National Label ‘Remarkable Garden’ by the Ministry of Culture. I love trees, so was in awe when I saw the gardens’ gigantic bicentennial plane tree, which was planted in 1780 and measures approximately 40m in height. A regular taxi might cost you between euro 50 and 70 to get you from the Frankfurt Airport to Oberursel. Since our regular airport transfer service Kilic * has changed his line of business (he now has a fish restaurant/shop in downtown Oberursel), I had to look for a another one. We are using My Car 24 Airport service & Flughafentransfer now. 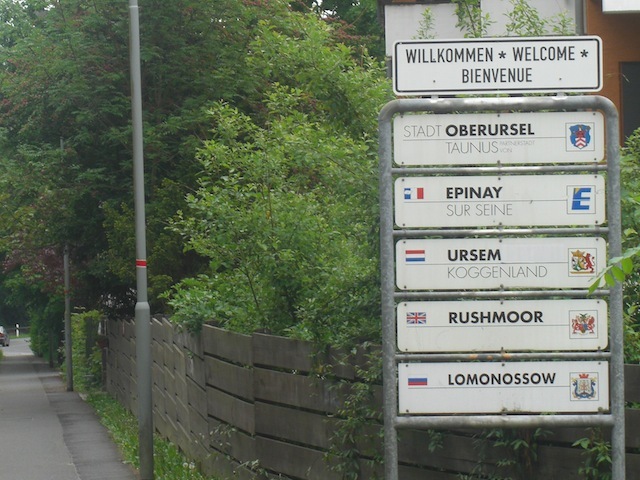 We’ve made four or five online reservations so far this summer, and it worked out really well each way – Oberursel to the airport, and vice versa. Leaving your cell phone on the online application is not only mandatory, but essential when it comes to finding your driver outside the busy airport. After reserving online, you get one mail with the data you entered. Within 24 hours, you get another mail confirming your online registration. They advise you to print it out – good to have if things went wrong – but I only take a screen shot. Making an online reservation is euro 33, a call-in reservation is euro 35. Unlike other blogger friends, I do not get any free services or products in return for recommending anything on this blog. I just want to share my experience with you. If this makes your life a bit easier, then that is my reward. 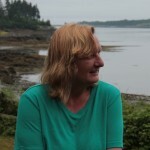 This accommodation was the last one on our road tour through parts of Canada and the USA. Not only was it the last one, but also the best one. 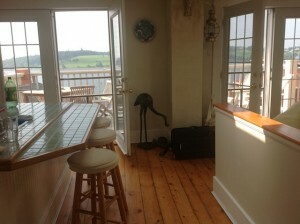 We had stayed in hotels, motels, lodges, vacation homes, vacation apartments, and in a boat house. All that in 18 days. This apartment my husband had booked via homeaway.com and it was wonderful due to its location, spaciousness, and level of comfort. 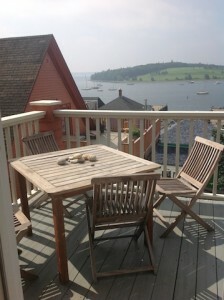 I especially enjoyed the sunny deck overlooking the Bluenose Wharf. This was my favorite spot in the morning. Even though the apartment is right in the center of this UNESCO town, it is a rather quiet area. This loft-style apartment is spacious and allowed even for a work place area. The bedrooms were average size, and fortunately equipped with ceiling fans. It was very hot and humid one day, which was not the usual weather, so we had been told. 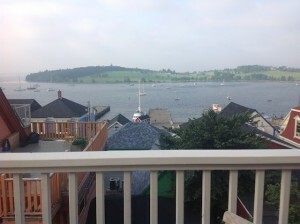 From the deck you can see big schooners, sailboats, and other vessels coming into the Bluenose Harbour. 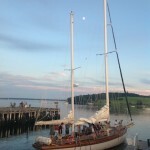 Two things I recommend while in Lunenburg are: have dinner at the restaurant The Great Dane and take a sailboat tour on the Eastern Star (just walk down to the wharf to buy your tickets). Both events are very memorable!